Parents play a central role in helping their preschool child adapt to divorce. Children between the ages of three and five become fearful of losing their parents. Consequently, their relationship with both parents is critical to the child’s adjustment. Children generally fare best when they have the emotional support and ongoing involvement of both parents. Be supportive of your child’s relationship with their other parent. Preschoolers have difficulty understanding the concept of time. The use of a calendar will help your preschooler anticipate parenting time between both households. To create the calendar, choose one color for mom and another color for dad. Color the blocks representing the days the child spends with each parent. Placing the calendar on the refrigerator and using a magnet to move through the days will help the child comprehend how much time until they see the other parent. Children between the ages of three and five do best when the parenting time schedule is consistent and predictable, and occurs in a “conflict-free” environment. A child’s adjustment to divorce is assisted when established routines remain constant. It is helpful to be clear and consistent in your parenting, discipline and daily routines especially at bedtime. Bedtime difficulties may arise, so be tolerant of new fears of the dark and other bedtime problems. Plan to give extra time and support at bedtime but maintain the schedule. DO not let your child manipulate you to extend there bedtime because YOU are feeling guilty over the separation. Children feel more secure when standard routines are maintained. Since preschooler often blame themselves for their parents’ divorce or separation, reassure your child that the divorce is not his or her fault. Offer reassuring words and extra hugs. Let your child know that both parents will continue to love them. Let your child know you and their other parent will always be around to love and protect them. Tell your child of changes before they happen and be available to answer their questions. In simple terms, explain where your child will live, where the departing parent will live, and when they will see each of the parents. Discourage reconciliation fantasies by letting your child know that Mom and Dad are not getting back together, and reiterate you will always love them and be there to protect them. Emphasize the finality of divorce. Be sensitive to your child’s emotional needs and allow your child to express his or her feelings. Be understanding to your child’s fears. Children this age are easily confused. Whenever your child is interested in talking about their feelings, be available but don’t keep bringing up the divorce or assume every negative feeling your child experiences is due to the separation. Respond by communicating with nurturing and understanding. Reading age appropriate books can be a valuable way to help him or her through the emotions and concerns they are experiencing in their own life. Children often identify with characters in a book. Talking about how the characters handle difficulties can offer your child awareness into their own divorce-related concerns. 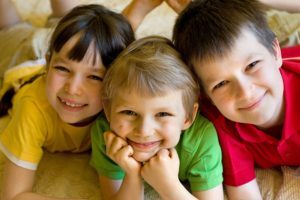 It is important to understant that each child will respond differently and within their own time frames, even compared to their own siblings. By remaining open and available to your child, you and the other parent will make the transition that much smoother for them.